Creating a custom front page is also known to the WordPress community as creating a Static Front Page. You can read more detail on the WordPress website for Creating a Static Front Page. When you first install WordPress, your front page is going to be the blog; the location where your post summaries will be published. A custom (or static) front page is when you move the blog to another location in your website so that you can create a custom front page. The WordPress site layouts your options as four (4) models. Blog: This is the traditional front page format with posts featured in reverse chronological order. Static Front Page: This is a traditional static HTML site model with a fixed front page and content placed in Pages, rarely if ever using posts, categories, or tags. Static Front Page Plus Blog: This model features a static front page as an introduction or welcome plus a blog to manage posts. Pages may be used to provide timeless content such as Contact, About, etc. Dynamic Front Page: Sometimes called the integrated model, the dynamic site design features a static front page plus blog, however the front page is dynamic. It may feature a combination of static and blog content (Page and posts). The Twenty-Eleven WordPress Theme offers that feature as an example with their Showcase Page Template. It features the most recent post in full or excerpt followed by the next most recent posts as post titles. There is an option to add a slider for featured posts set as Sticky Posts above the first post, creating a dynamic mix of content on the front page. This will guide you through the setup of a custom front page by moving the blog to a different location in your website. We’ve made our front page, now it’s time to create our blog page. 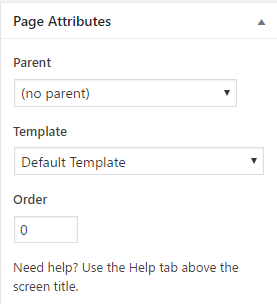 Do not add any content to the editor and you do not select a page template. Now we need to go to the Admin settings to assign the pages we created for the front page and for our blog.